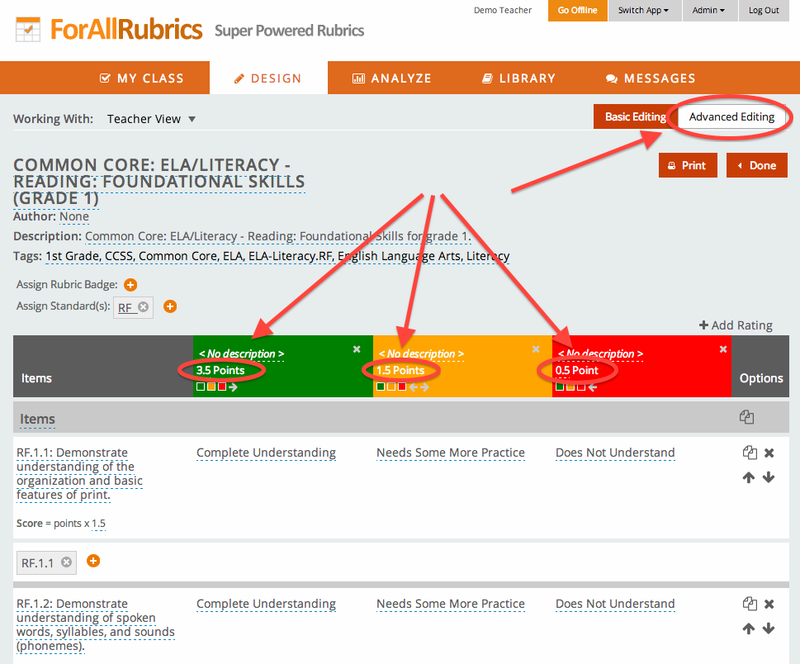 This post will walk you through two ways to use ForAllRubrics to support our most requested feature, student self- and peer- assessment. 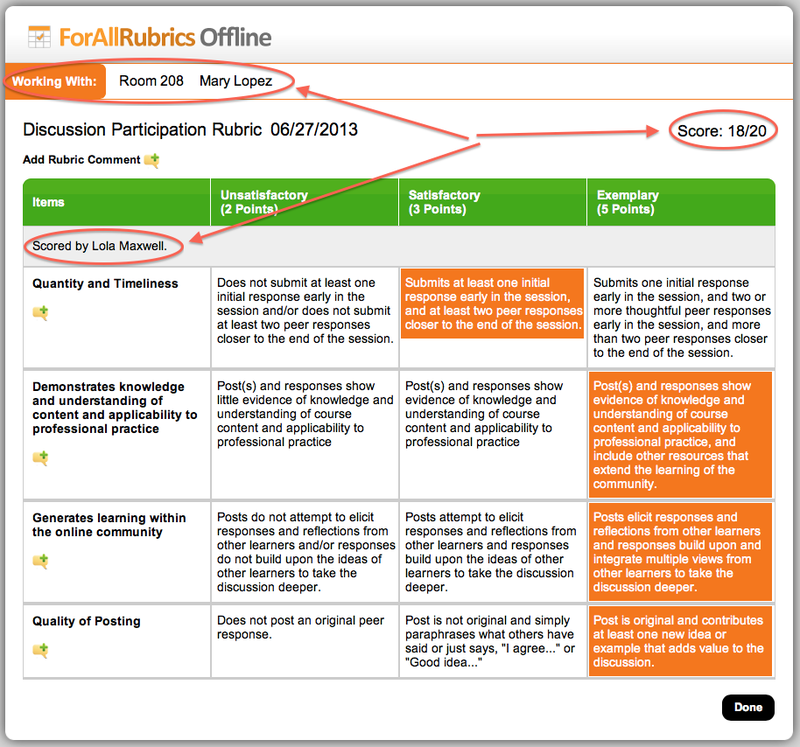 Teachers can use their own teacher account to login into ForAllRubrics Offline on their iPads and pass the iPads out to the students to use. They can use their one account on multiple iPads. 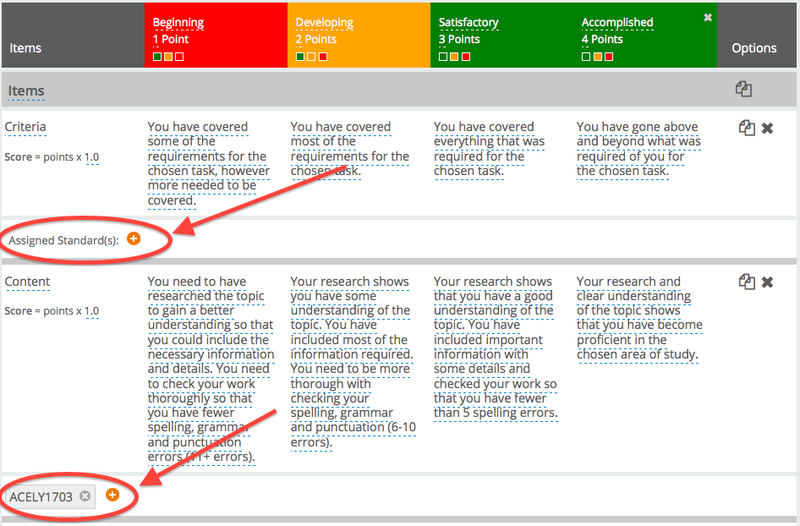 The students can use the rubric comments field to indicate who did the assessment. This works especially well, if you aren’t able to give students their own accounts. Another approach is to have the students do the self- or peer- assessments with their personal accounts. 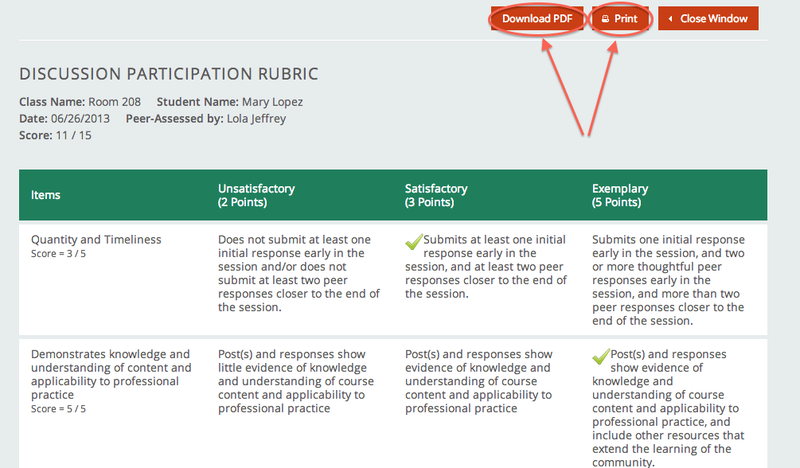 For an introduction to student accounts, see the post, “ForAllRubrics How To: Student Journals.” Below are the steps for enabling your rubrics for student self- and peer- assessment. When you’re editing a rubric that you want student to access, make sure that you’re in advance mode and the rubric has the “Allow Students to Self/Peer Assess” checkbox selected. When you select the checkbox a default badge will be created. You can customize the badge, by clicking on the badge name next to “Assign Badge”. To set up student user accounts go to the Admin/Manage Students page. 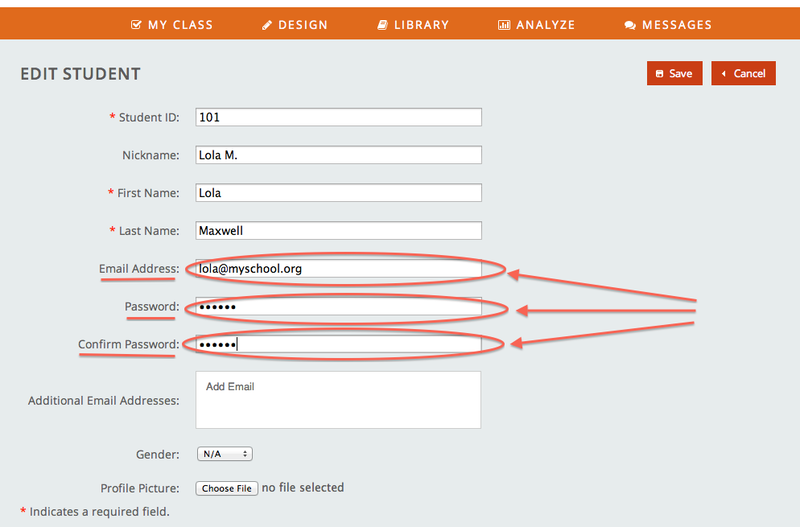 Create student accounts by setting their email addresses and assigning passwords. 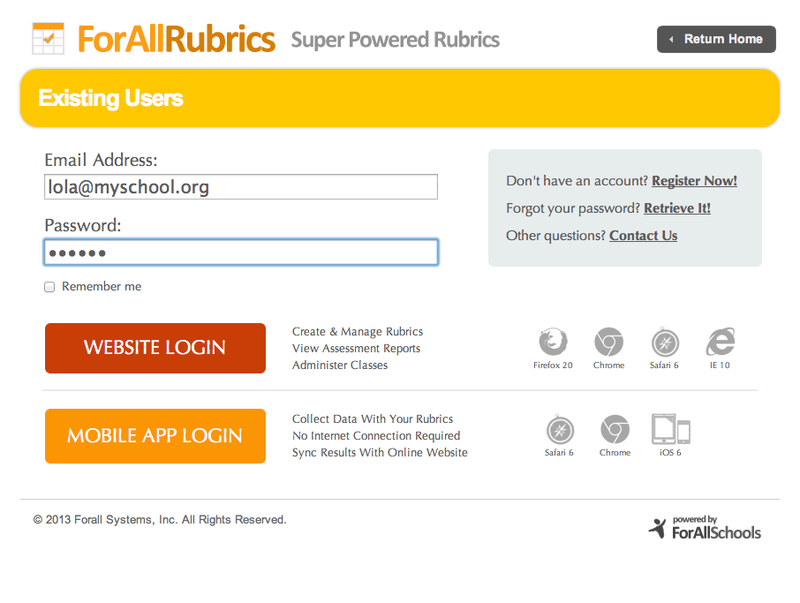 Students can then login to ForAllRubrics using their accounts. When the student logs in and goes to the “Classmate Badges” page, she sees all the students in her class (including themselves) and can choose who to assess. Once the student selects who to assess, they will see the badges that are shared with them and they can choose which badge to assess for. When the student chooses the badge to use the appropriate rubric will pop-up and she can enter her scores. When the assessment is complete, the student can now see the badge they have issued. 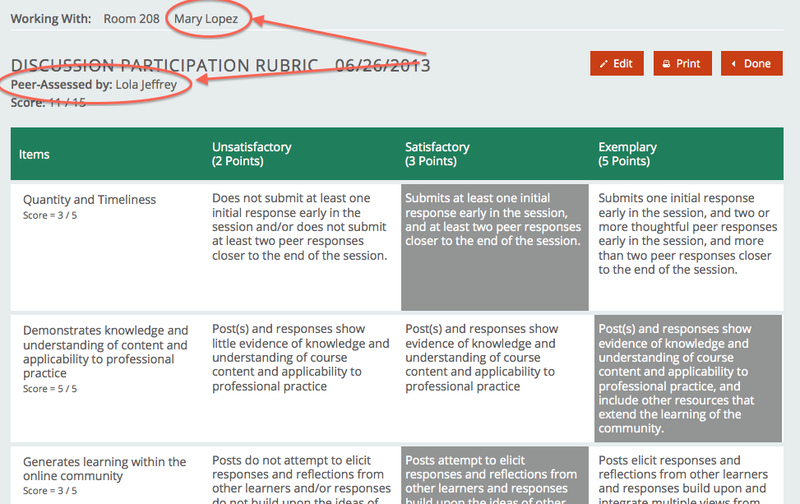 When you login as the teacher, you will see the rubric that was assessed by the student. 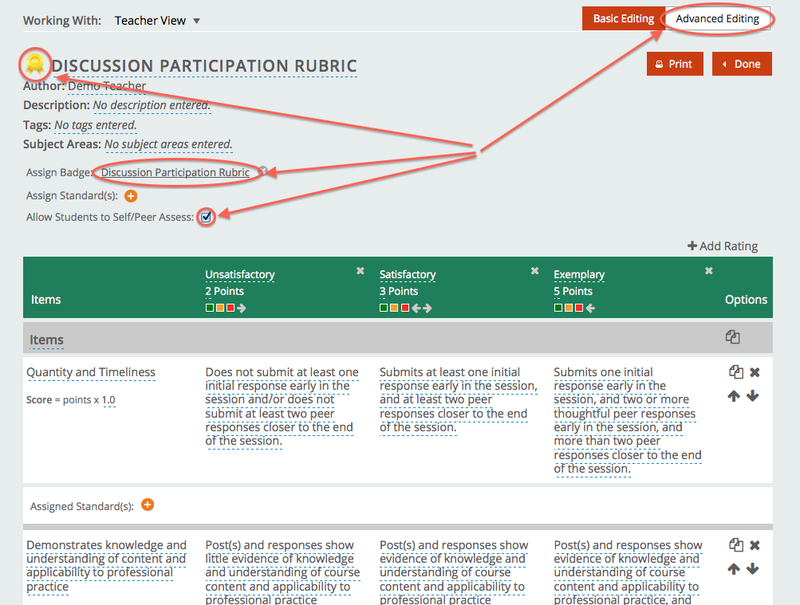 You can click on the date the rubric was assessed to see the details of the assessment. When the assessed student logs in to her account, she sees a journal entry with information about the rubric assessment. 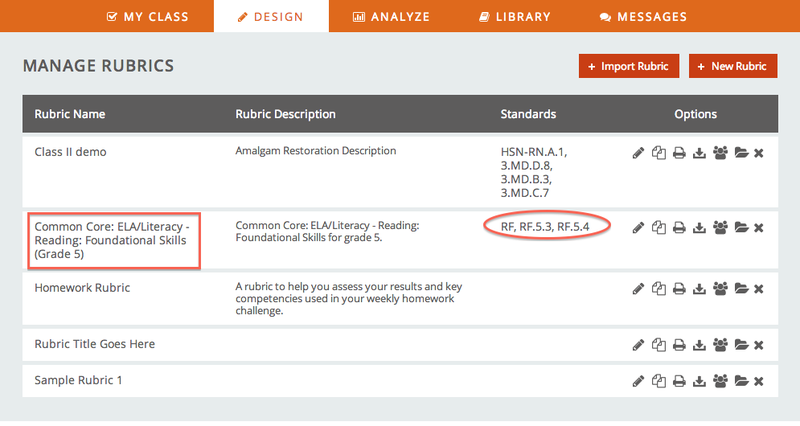 When she clicks on “View Rubric Results,” she sees the details of the rubric scoring and can download the completed rubrics as a pdf file or print it. 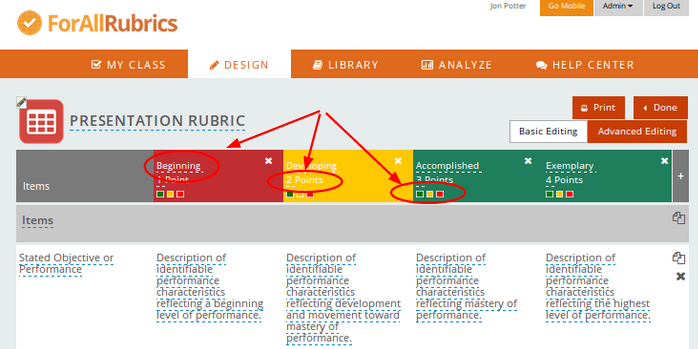 Please let us know your thoughts on self- and peer- assessment in ForAllRubrics. We’d really welcome your feedback. 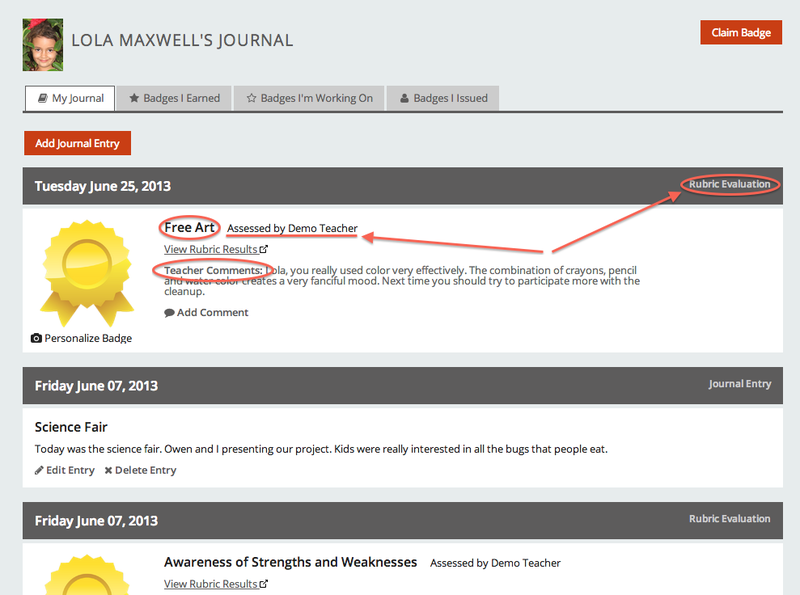 The student journal is the communication center for student accounts on ForAllRubrics. When a student first logs in, she sees her journal. In the example below, the top entry is a journal entry that was added by the student Lola about her experience presenting her project at the science fair. 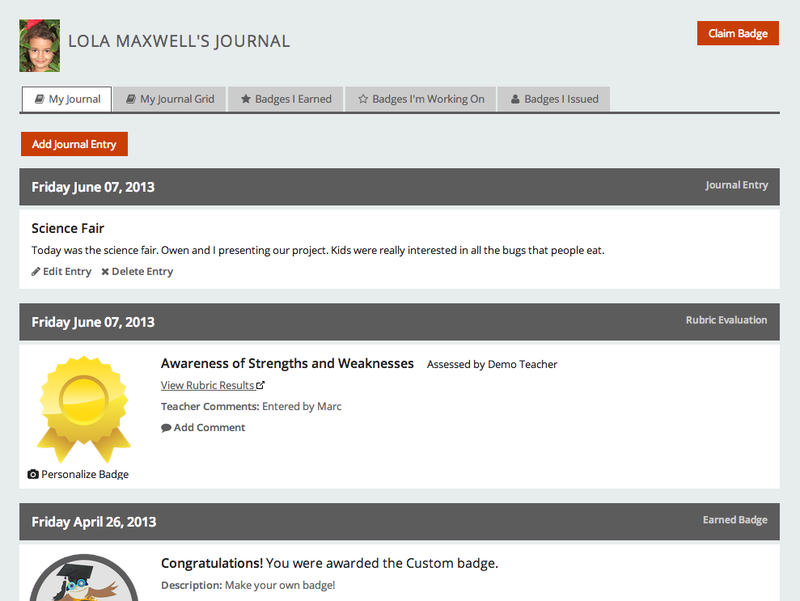 Teachers can view the journal for any of their students by clicking on the “journal” icon on the MY CLASS page. 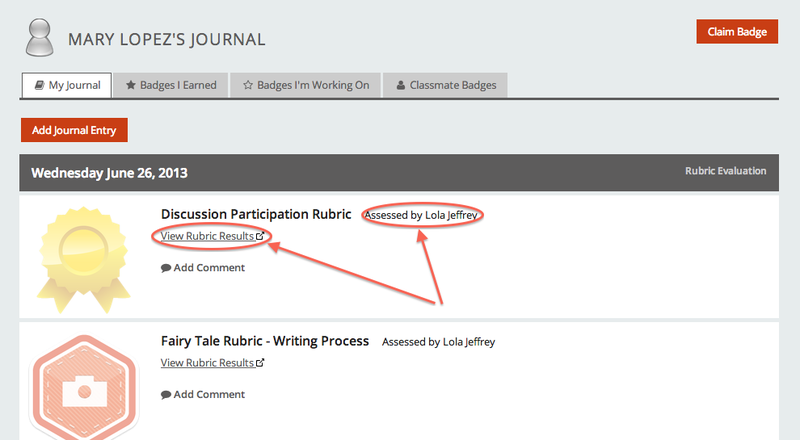 When a teacher completes a rubric for a student, the results appear in the student’s journal. 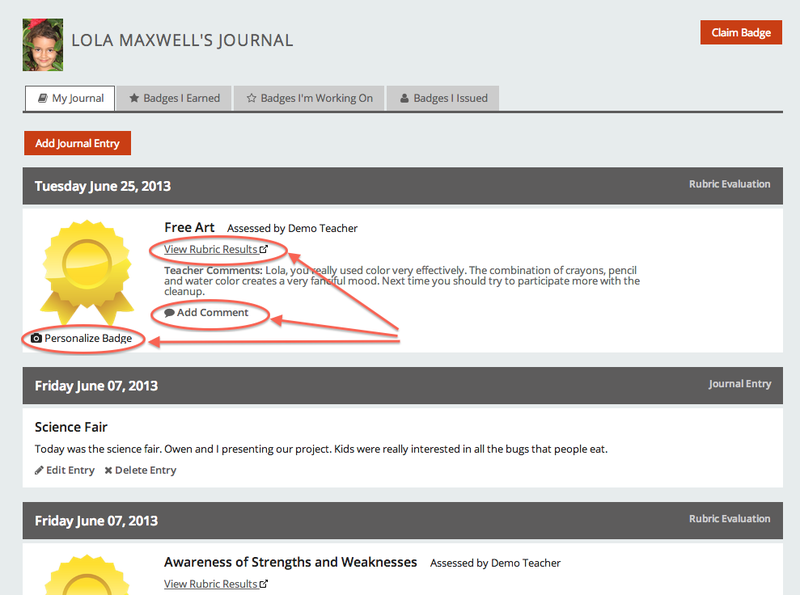 Below you can see that the “Demo Teacher” assessed the student with the “Free Art” rubric. 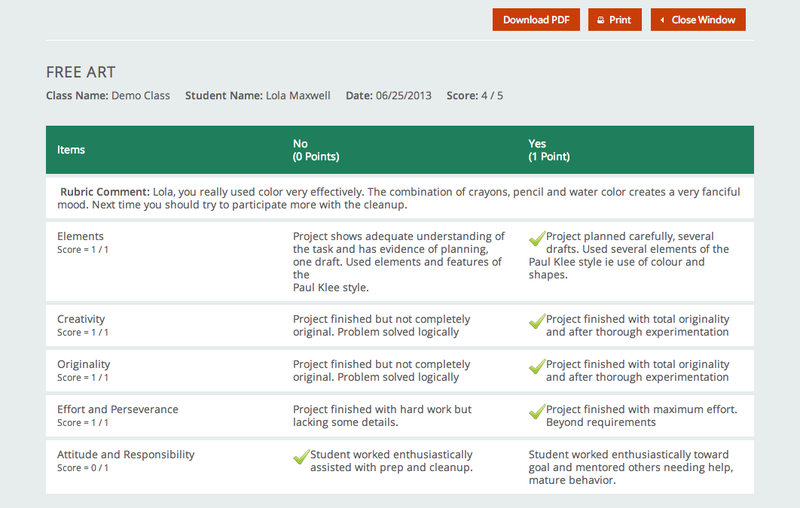 The teacher’s comments that were entered while the scoring the rubric are displayed to the student. 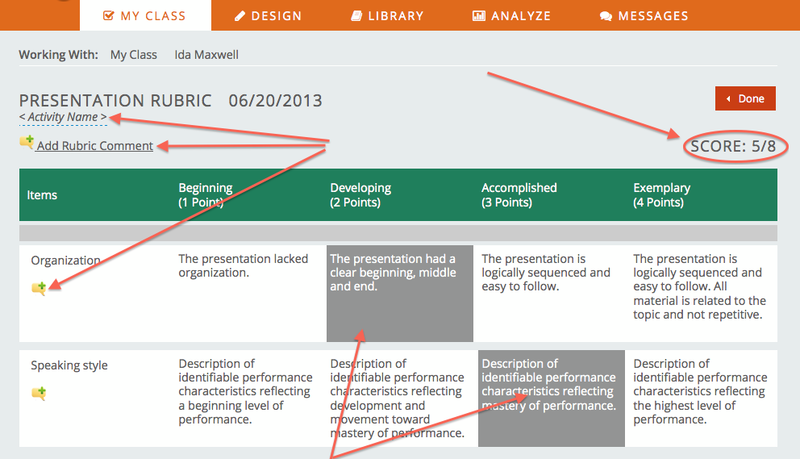 personalize the image associated with the rubric. 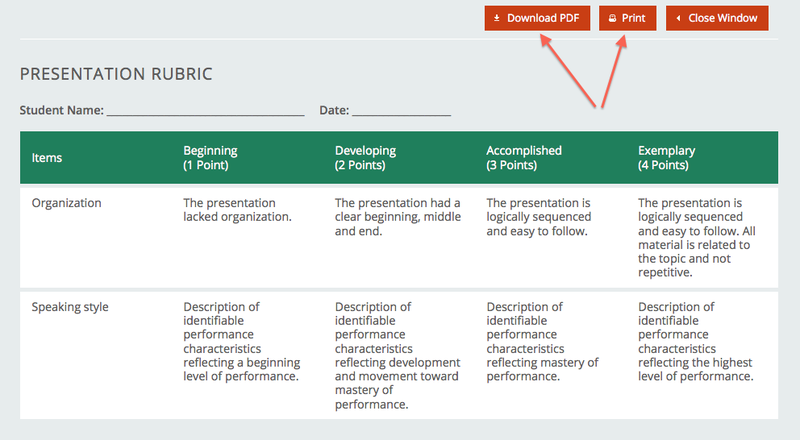 If the student clicks on “View Rubric Results,” they are taken to a print view of the scored rubric where they have the option to either download the scored rubric as a pdf or send the scored rubric to a printer. Our student Lola, has added a comment and personalized the badge by making a photo of her artwork the image. 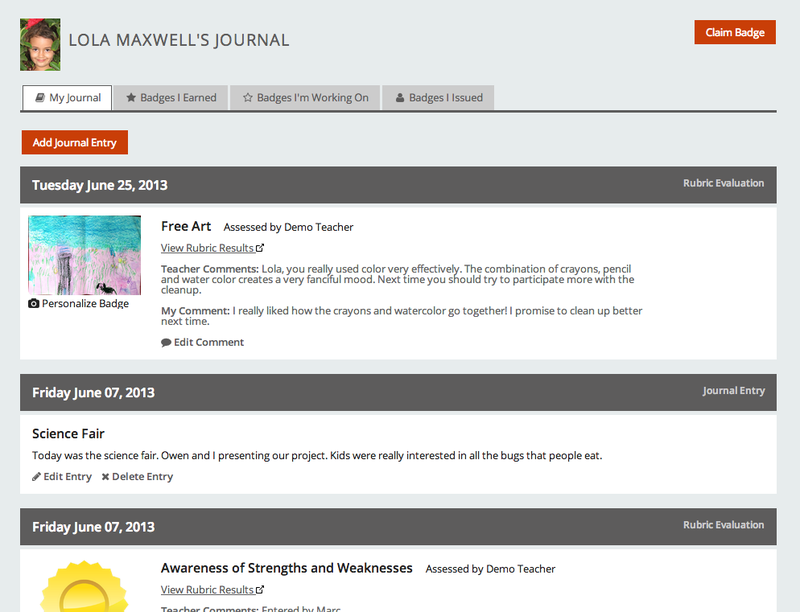 This quick introduction to the Student Journal should help you get started with using ForAllRubrics to communicate with your students. For more information on setting up student accounts, take a look at the post ForAllRubrics How To: Setting Up Your Roster. 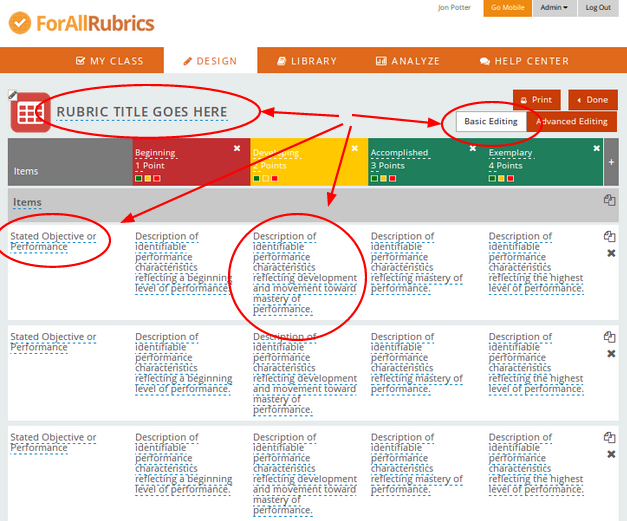 There are more posts on the way, including information on how ForAllRubrics supports self- and peer- assessment for students. 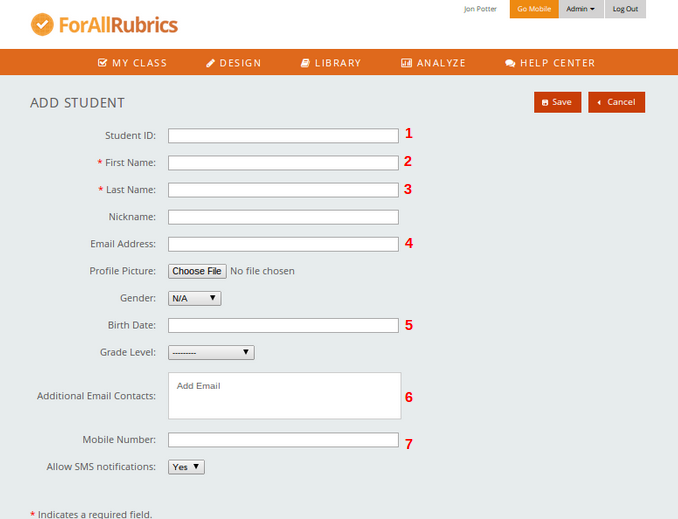 When you first login with your ForAllRubrics account, you’ll see something like the screen below. To add a student, you will need to complete the information shown below. Documentation for the trickier features are provided below. Please keep the feedback coming! 1. 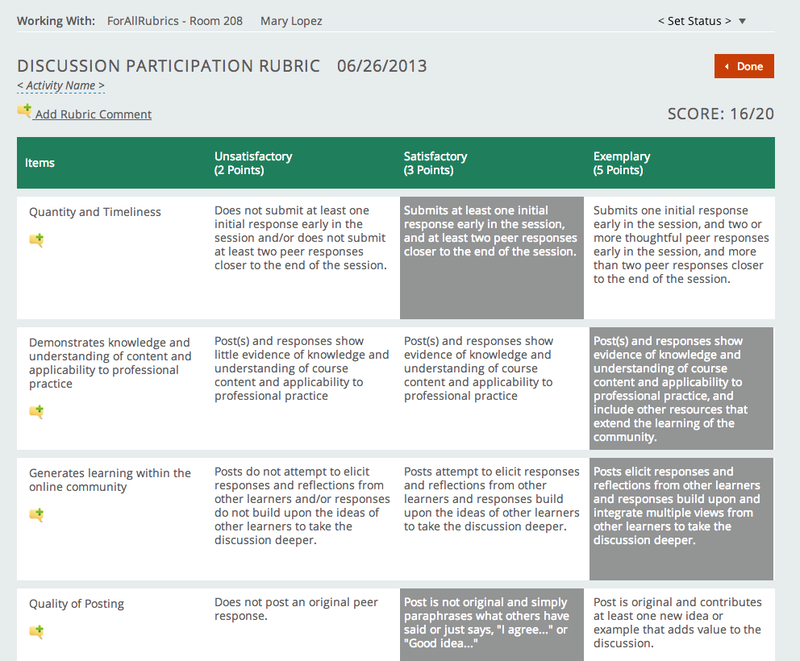 Choose a rubric that is aligned with standards. 2. Go to the Rubric Standards Report. 3. 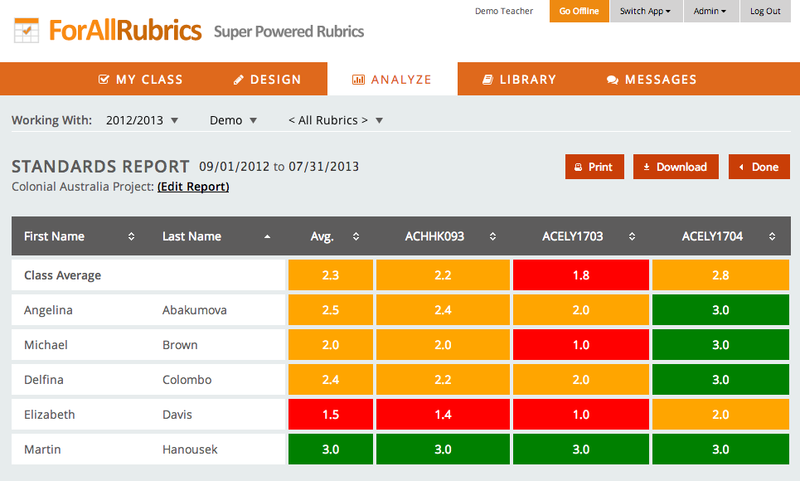 Report is automatically generated for the standards that appear in the rubric. 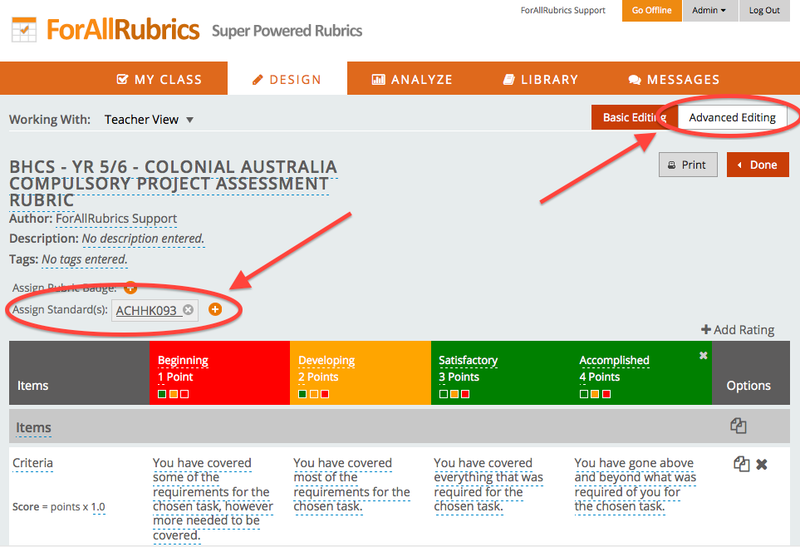 We are very excited to announce that teachers can now use ForAllRubrics to work with rubrics aligned with the Australian Curriculum in addition to the existing support for the Common Core State Standards. Standards Based Reporting With the Standards Report, you can easily view the individual levels of achievement for all the students in your class. Alignment of Rubrics. 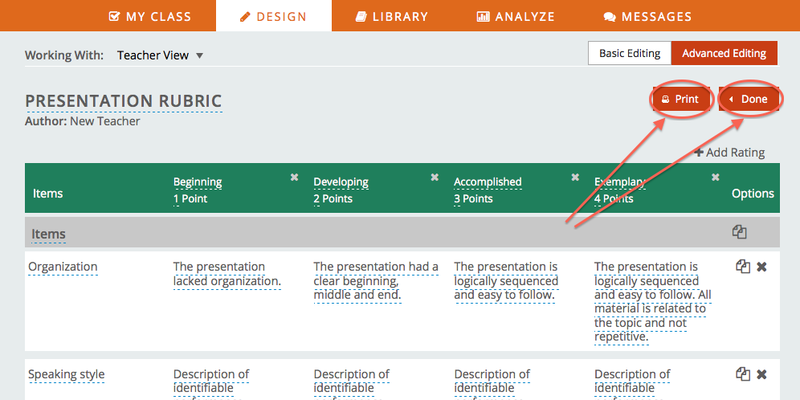 In advanced editing mode, you can align your whole rubric to one or more standards. Alignment of Rubrics. 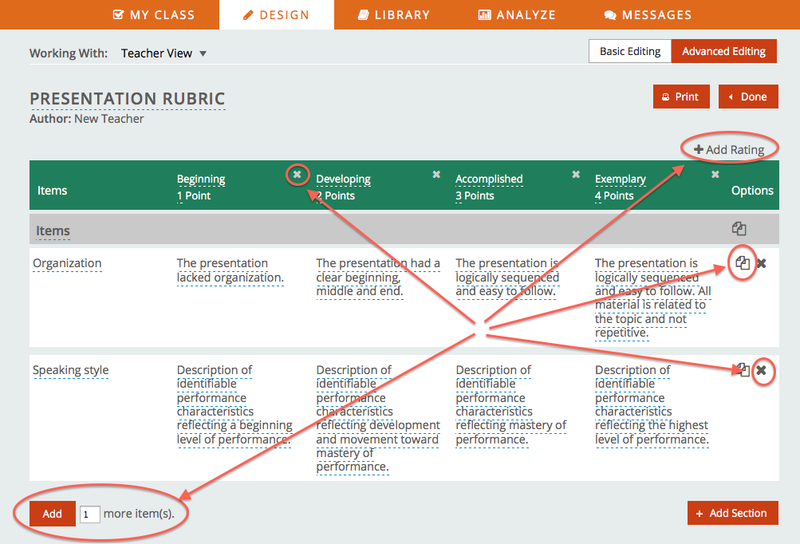 You can also align individual items within your rubric to one or more standards. Alignment of Rubrics. 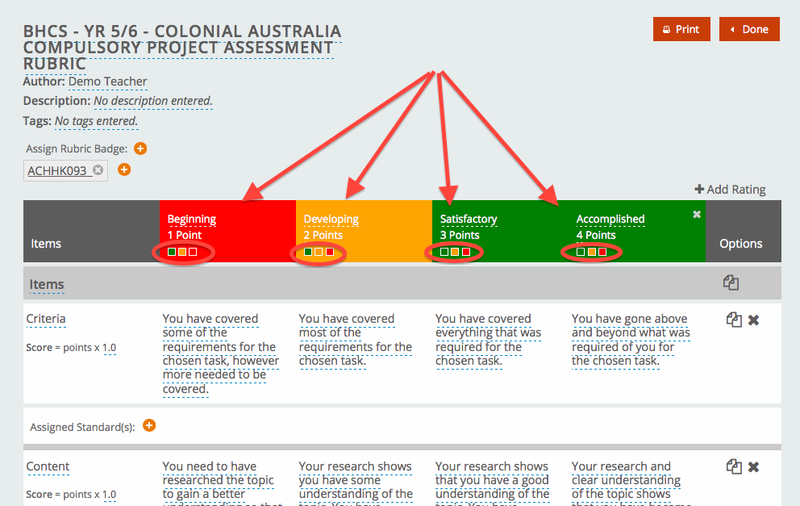 You can customize the level of achievement for the ratings in your rubric (red, yellow or green). 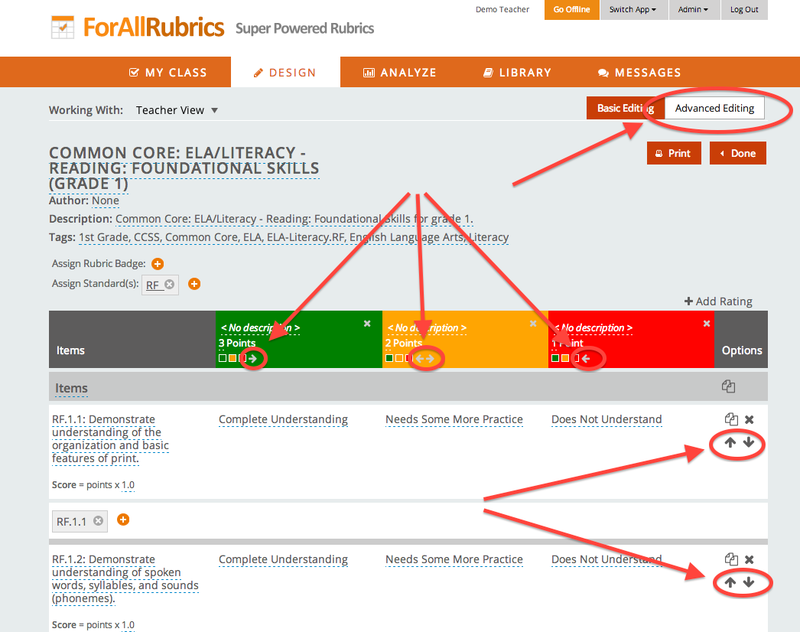 A big thank you to all the Australian teachers using ForAllRubrics! We really appreciate your enthusiasm and support. We hope these new features are helpful to you in your classroom.